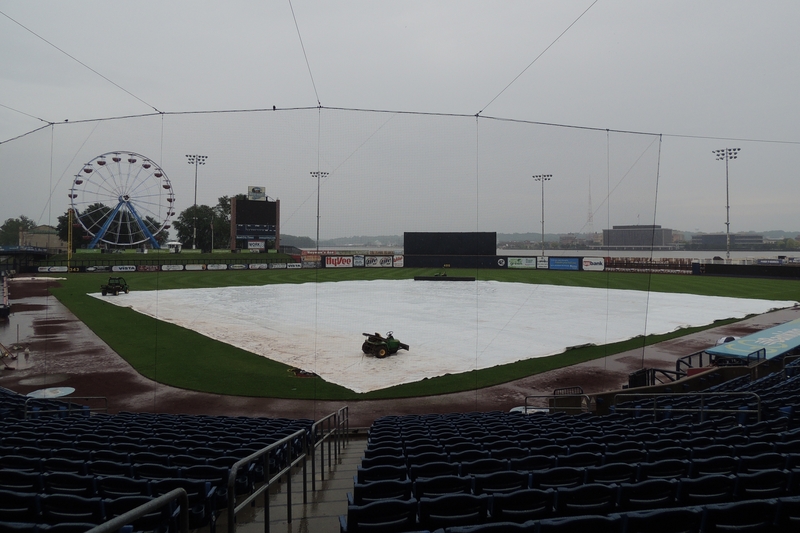 The scene at Modern Woodmen Park on Saturday afternoon. 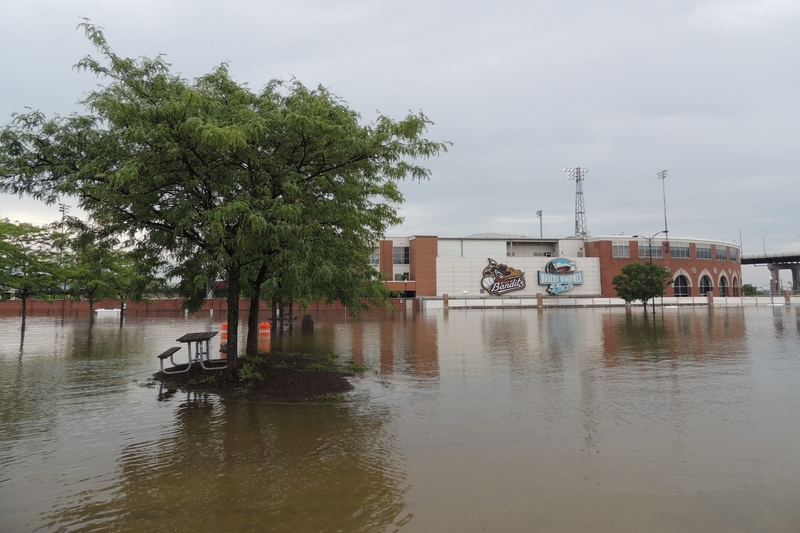 A few hours of sometimes-intense rainfall Saturday afternoon resulted in the Quad Cities River Bandits-Wisconsin Timber Rattlers game being postponed. The game will be played as part of a doubleheader Sunday. I won’t be going to the Sunday doubleheader because I’m heading up to Clinton to see the LumberKings take on the Kane County Cougars. I’m tempted to stay in the Quad Cities for the double dip, but the draw of finally getting to see Jen-Ho Tseng pitch is stronger for me. Tseng is 3-0 with a 3.22 ERA, 51 strikeouts and 7 walks in 50.1 IP for the Cougars. He is scheduled to face off against Jose Flores, who is 2-0 with a 4.18 ERA, 32 strikeouts and 22 walks in 56 IP for the LumberKings. 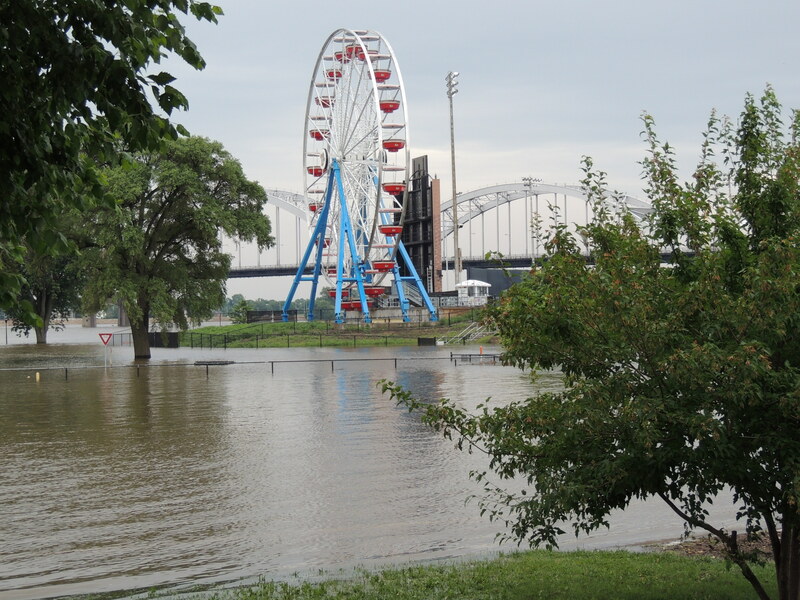 Anyway, my trip to Davenport wasn’t a total wash because I got the chance to shoot some photos of the Mississippi River flooding around Modern Woodmen Park. 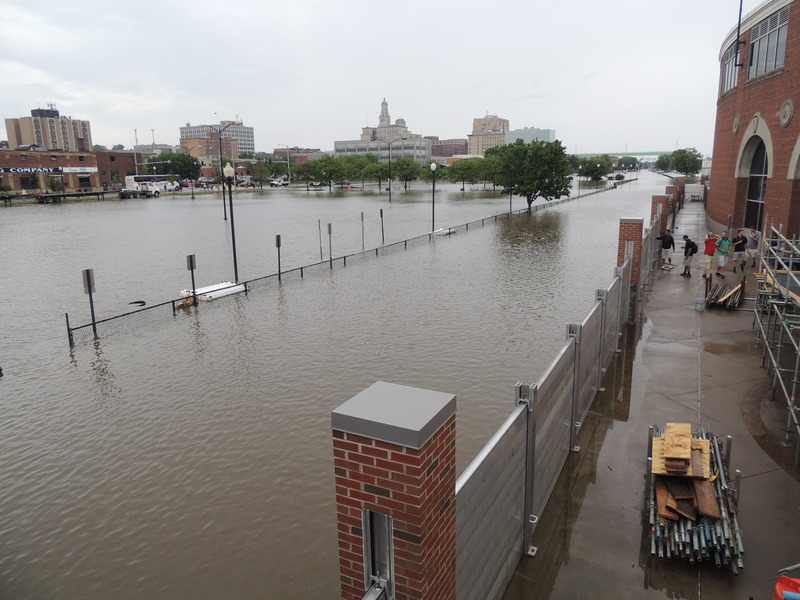 Two things to note in the following photo: the temporary bridge used by people to gain access to the ballpark, and the completely flooded parking area beneath the Centennial Bridge. The next shot is looking down from the temporary bridge. 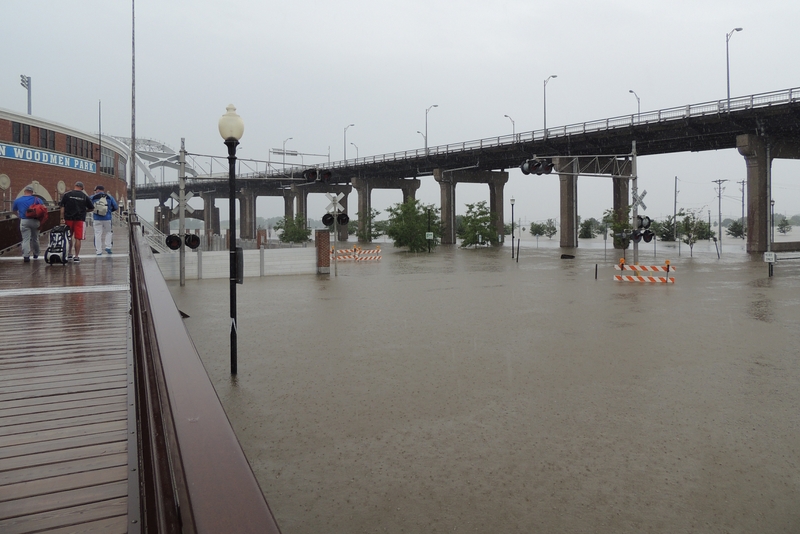 Most of the flooded area normally is a parking lot, but in the middle of the photo there also are unseen railroad tracks between the fence and the flood wall. 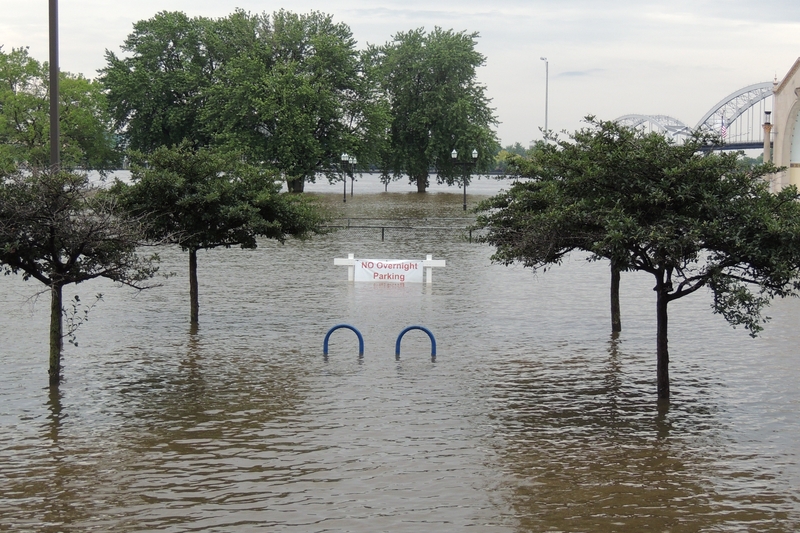 The next photo looks at Modern Woodmen Park from the other side of the flooded parking lot seen in the previous picture. I shot it while standing on the sidewalk along the south side of River Drive, the closest I could get to the park without getting wet or using the temporary access bridge. Needless to say, I obeyed the sign. This entry was posted in Clinton LumberKings, Kane County Cougars, Midwest League, Quad Cities River Bandits, Wisconsin Timber Rattlers. Bookmark the permalink.